Yesterday I wrote about the removal of Disaster Transport during or at the end of this season. The other casualty that I mentioned briefly is the Space Spiral. This is a ride that I remember actually standing in line for in the 1980’s. Granted for the most part this is just a walk on ride today, but back then it was the tallest ride in the park. 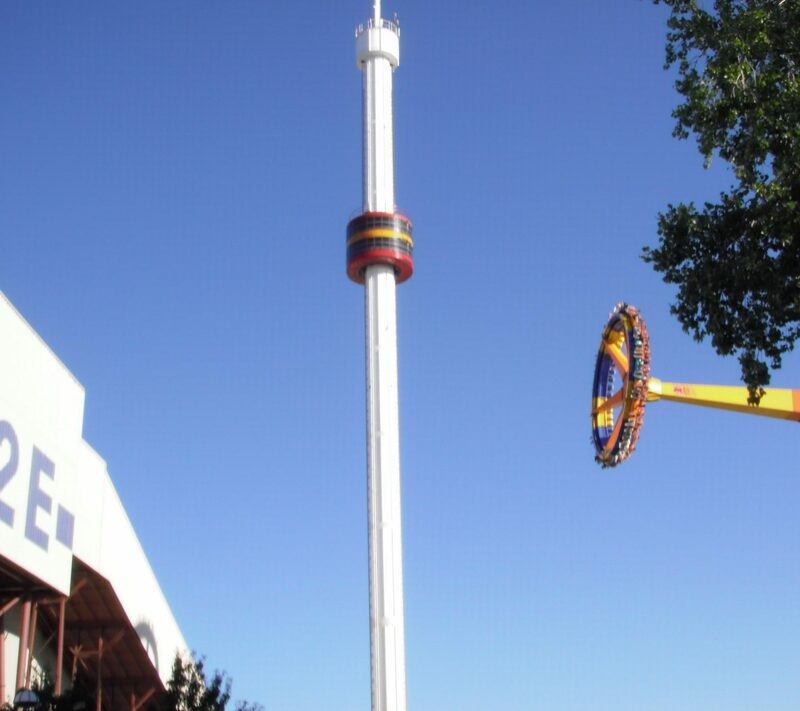 The ride was built in 1965 and was the first amusement ride in the world to break the three-hundred foot mark. The unique thing about this tower versus other ones is the two levels for passengers. I’m not sure there are any other double-decker observation towers anywhere in the world. If there is I’m sure someone will leave a comment and correct me. The ride slowly rotates around as it rises and descends giving you a view of the park. When it was originally built it was much closer to being the center of the park (pre-frontier land). One of the comments I saw on the forum is they should build a new observation tower near the Iron Dragon. This would give a great view of the park and center it once again. They took the spiral theme seriously. You can see in the picture below that even the lines were spiraled. On the spiral line there was an entry and an exit line sectioned off on the ramp. On the right-side you would enter the line. Once you made it to the first stop you would run into an attendant. 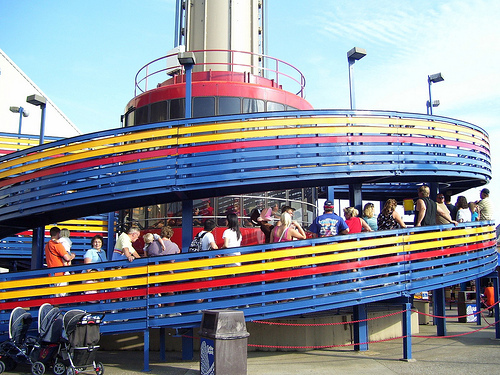 If the ride was running at full capacity the attendant would count off people and send them to the next line to the upper level of the ride. For the last few years they have only used the lower section of the ride. I don’t think I rode it back in 2006 which was the last time I had a season until this year. Before that though, I don’t remember a year that I owned a pass and haven’t ridden it. It was a nice relaxing break through the day where you could just relax. Last weekend (before the story of the possible removal) we actually did take Lex to go ride it. Unfortunately it was not working. Out of all the things in the park though, this is one of the few that I don’t have a wild crazy story about. Some rides I have stories that I would physically tell you, but not put into print. This doesn’t even have those. Like I said it was a calm in the storm. It was an icon that I could always look at and recognize we actually were at Cedar Point. It was a major part of the skyline for all of my years visiting the park. Finally I will leave you with the most exciting video we have seen in my “memories” series. It’s a point of view video of riding the space spiral. Ok, it’s not that exciting. It is, however, a landmark that will be missed from the skyline of Cedar Point.